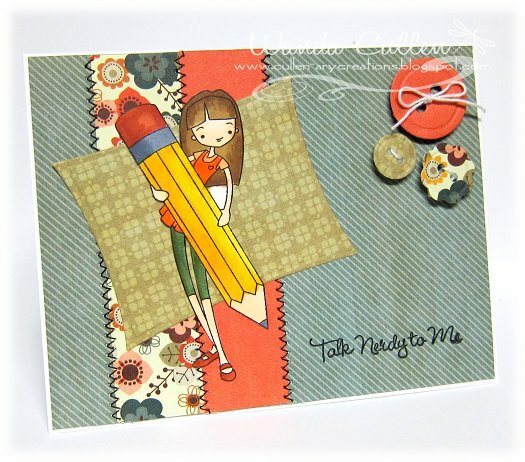 I went back to some holiday DP from last year to create this card for MFT's Wednesday Sketch Challenge! Had lots of fun paper piecing the coat and coloring with Copics! Martha's crystal fine glitter was added to the fur trim and to the punched snowflake. 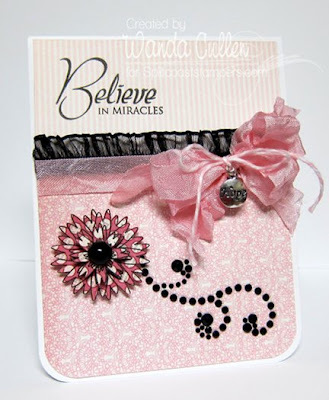 ACCESSORIES: Ribbon (Flourishes), MS snowflake punch, Rhinestone, MS fine glitter,Copics . 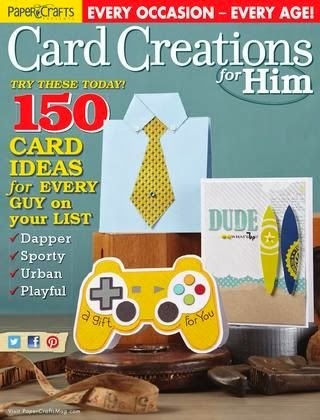 ...your card - that's what! It's time for another Raise the Bar challenge and this time we're keeping you in stitches! :-) Real or faux...you choose...but you have to use some kind of "stitching" on your creation. I zigzagged down one panel and straight-stitched around the smaller panel. This was such an easy card because I let my DP do it for me! I tweaked Julee Tilman's layout for the Mojo Monday sketch challenge and let the "ribbon" on the DP serve as the horizontal element. 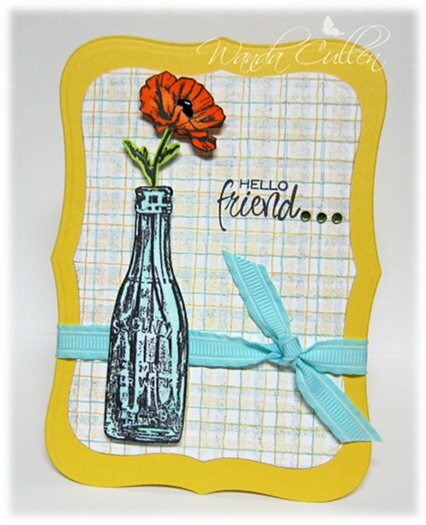 I stamped the hello sentiment from Verve's Tag Time set. The leaves were die cut using SU's Sizzlet Little Leaves die. The prima was a perfect match for these Lost & Found Two "Sunshine" papers by My Mind's Eye...LOVE their paper! Thanks for stopping by...I'm enjoying another day of work - woohoo! Happy Wednesday! That means it's Color Throwdown challenge time and this week, that talented lil' inker, Laura Pryor, has a sunshiny combo for us: Pool Party, Peach Parfait, Daffodil Delight & Old Olive! I consider this to be a CAS card with very little frills. 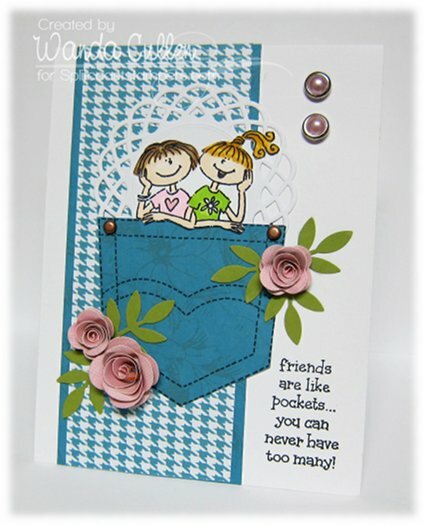 I made my own DP by first stamping the Stipple Plaid BG in Daffodil Delight, then in Pool Party. 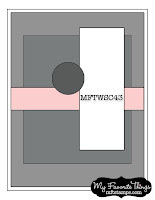 The card base is 2 Labels Eight Nesties shapes adhered together using Scor-tape. I fussy cut the main image and popped it with foam squares to give it dimension. ACCESSORIES: Labels Eight Nesties, Copics (BG11, YG03, YR65, YR68), Enamel Accents (black) used for center of poppy, Pool Party ribbon by SU, Green gemstones by Hero Arts. 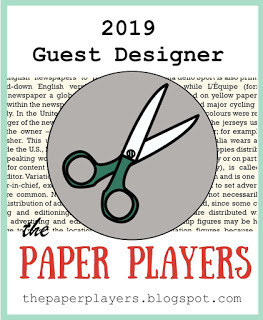 Stop on over and see what the other members of the design team created! You can check it all out HERE! It's a gorgeous fall Sunday and I'm getting some stamping done while the football games and Nascar race are on in the background! Guess you could say I'm a multi-tasker - lol! 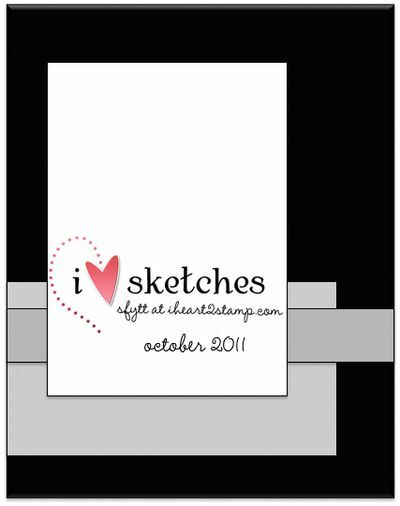 This sketch is for MFT's Wednesday Sketch Challenge...another fun one with tilted panels! 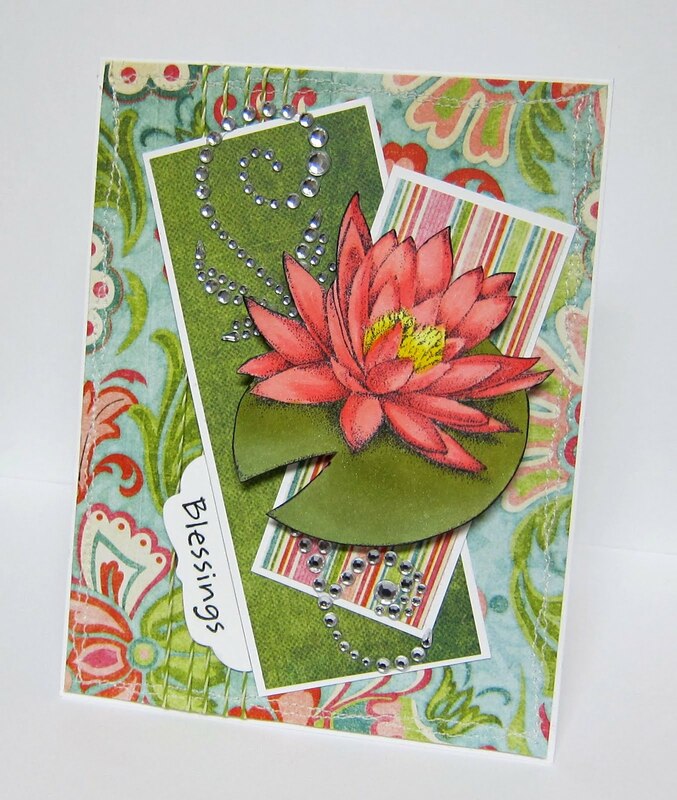 I wanted the waterlily to be the focal point and thought this DP from MME's Pink Photo Mat Pad would work well. I sprayed the lily with Tattered Angels Dazzling Diamonds Glimmer Mist after coloring with Copics. I did my "drunken" stitching around the edges. :-) Thanks for stopping by...I always appreciate your comments! STAMPS: Inspired By Flowers 3 by MFT; My Basket of Eggs (sentiment) by MFT. ACCESSORIES: Baker's twine, Rhinestone flourish, Copics, Labels Four Nestie (cut in half to create tab element). This week's Raise the Bar challenge is to use orange and black...and it doesn't have to be a Halloween card. 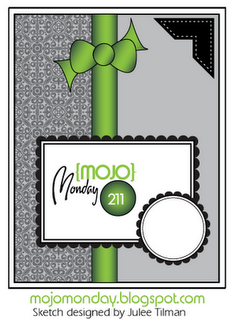 I used Julee's Mojo Monday sketch for the layout and went with a birthday theme to build up my stash for this occasion. The cupcake was paper-pieced and I added some crystal fine glitter by Martha to the "icing". Be sure to stop at the RTB blog to see what the other Bartenders created! 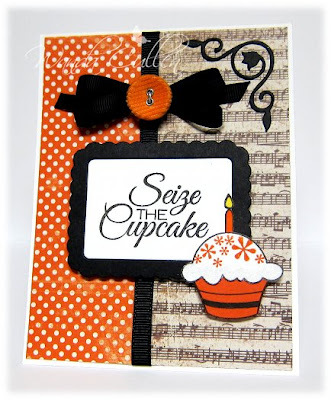 ACCESSORIES: Rounded Scallop Frame die by Verve, Grosgrain ribbon, Corduroy button (SU), Corner scroll die by ProvoCraft, Crystal fine glitter by MS.
Broni has some yummy fall colors this week for the Color Throwdown challenge: Pumpkin Pie, Old Olive, Rich Razzleberry & Black! I created my own DP using Tim Holtz' Falling Leaves set then added this turkey image and sentiment from Verve's Bountiful Harvest set. I stamped off once when I used black ink, so those leaves appear to be gray. Simple layout...some buttons and a layered border and this Thanksgiving card is completed. 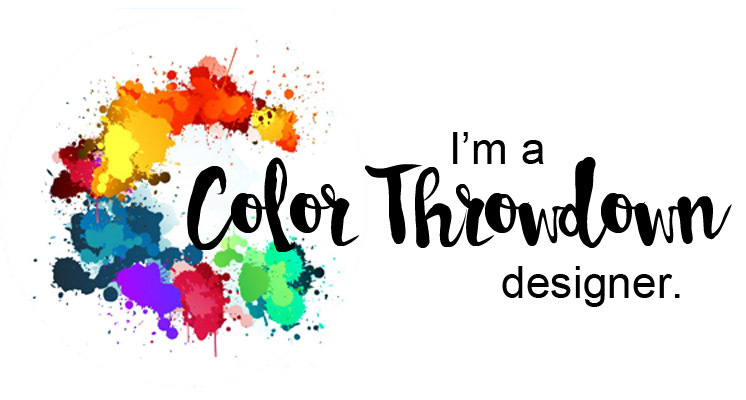 We'd love to see what you create using these colors, so hop on over to the CTD blog HERE and join in! 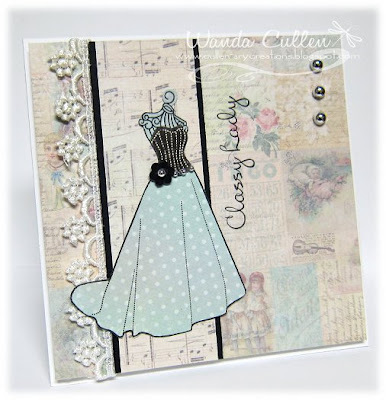 ACCESSORIES: Buttons, Lotus border petites die by Spellbinders, Copics, Thread. This is the first time I inked up this nerdy ala mode and thought she'd be perfect for last week's MFT Wednesday sketch challenge! I'm trying to keep up with the weekly sketches...aiming to get lucky at the end of the year for the big MFT prize! I have to digress briefly and share about my day trip on Saturday to meet up with Barbara Anders and Tammy Hershberger. Teresa Kline and I grabbed some drinks at Starbucks and headed down the highway to meet the other dirty girls in Danville, VA. It was an 11:30 date at Olive Garden and that was when the gab fest began! The poor waiter could hardly get a word in edgewise and the look on his face when I told him he was serving a group of dirty girls was priceless! LOL! We were there about 3 hours before heading to Hobby Lobby and we continued our fun! Teresa and I were both so amazed at how easily we connected to Bar and Tammy...we were kindred spirits and had so much in common! We had gorgeous weather to top it all off! It's on our bucket list to get together again! ACCESSORIES: Wonky rectangle Nestie, Button Die-Namics (MFT), Stitching, Copics. 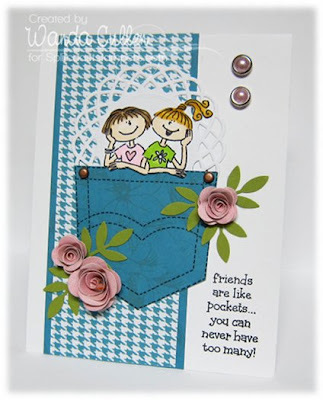 Patty has challenged us to create a collage card for her HYCCT challenge on SCS and I chose to do an inchie collage BG. I combined 2 BG stamps for the inchies (the floral and the french script - both retired from SU) then cut them into 1 1/4" squares. 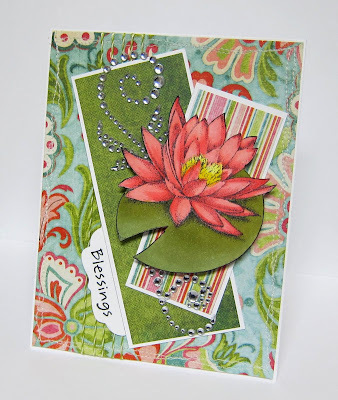 The flower is my first attempt to use the Spiral Blossom One die by Spellbinders...so easy to work with! While it was still in the die, I sponged the petals with Melon Mambo ink (hard to see it in the photo). I rolled it using my petal roller tool, then used the ball tip of the tool to curve the petal edges under. The leafy flourish die is by Cheery Lynn Designs. ACCESSORIES: Cheery Lynn Designs' Leafy Flourish die, Tiny tags die by PTI, Satin ribbon, Spiral Blossom One die by Spellbinders. Very seldom do I include non-stamping posts, but I thought I'd share some pics of the retirement reception I coordinated for our director of nursing. 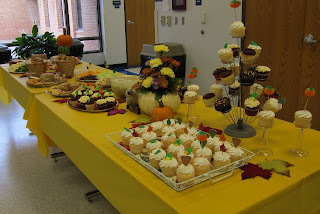 Decorating the tables was the most fun part of my job! 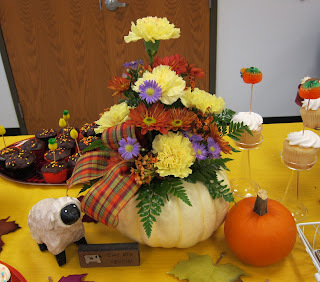 I hollowed out a white pumpkin (in this case I opted for a fake one from Michael's) and had a florist fill it with fresh flowers. I love following photos on Pinterest and saw the idea of using candle holders to bring height to smaller pumpkins. 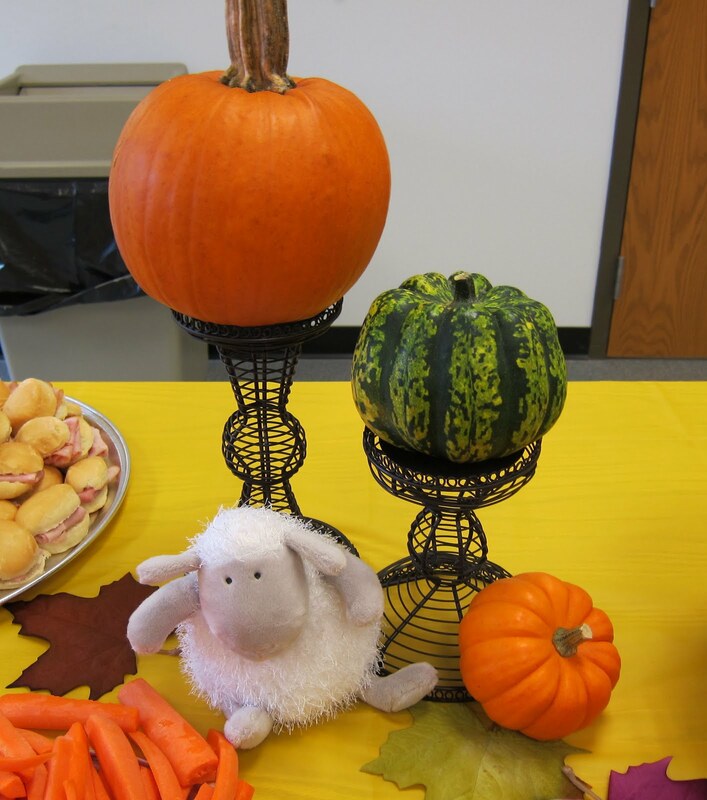 Since my DON lives on a sheep farm, I used the theme "We will miss ewe!". I know...you just can't keep me from using cheesy puns! 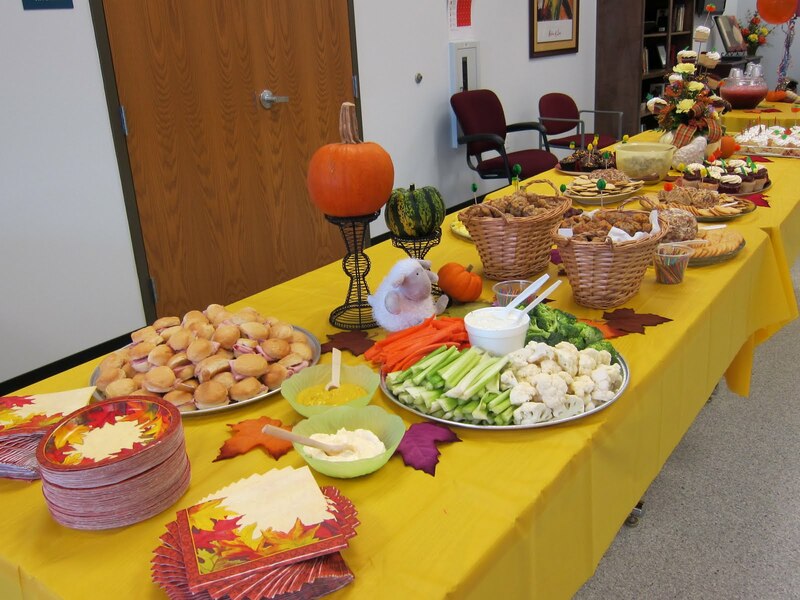 I didn't include the many pics with staff, but they all enjoyed the food and fellowship immensely! I also helped compile a photo album of all the nursing staff to present as one of her parting gifts. So, this is what consumed much of my time in the past few weeks, but I was happy to do it for a dear co-worker that I will REALLY miss! It's Friday and that means Joni has a new challenge posted on the Raise the Bar blog! This time we're remembering that October is breast cancer awareness month and we are to create with the color pink. I wanted to combine this with one of SCS's HYCCT challenges and chose Lee's inspiration photo with the fun boobies to spur me on. Normally, I cluster flowers in odd numbers, but in keeping with the "boobie pairs", I kept it to 2 flowers on this card! I also used DP with pairs of birds in the design. I wanted this great sentiment from Verve to be the focal point and continued with using Jen Del Muro's super sketch for her monthly Sketch For You To Try challenge. This also fits for the Ways to Use It challenge on SCS to use pink, pink, pink. Whew! Think I covered all 4 challenges adequately! TGIF and I'm off work today and tomorrow! 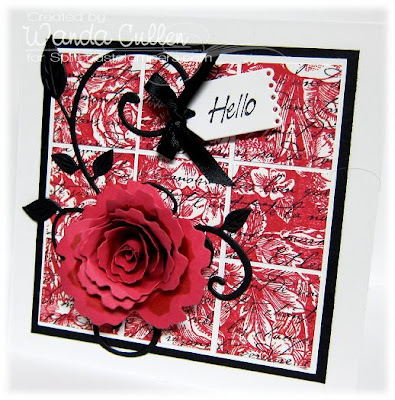 Have a fun trip planned tomorrow with a stamping buddy...have a good day everyone! It's hump day and that means it's Color Throwdown time! 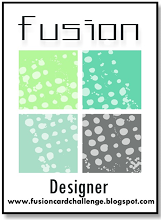 Barbara Anders has a great color combo this week: Poppy Parade, Pear Pizazz, Baja Breeze, Early Espresso. 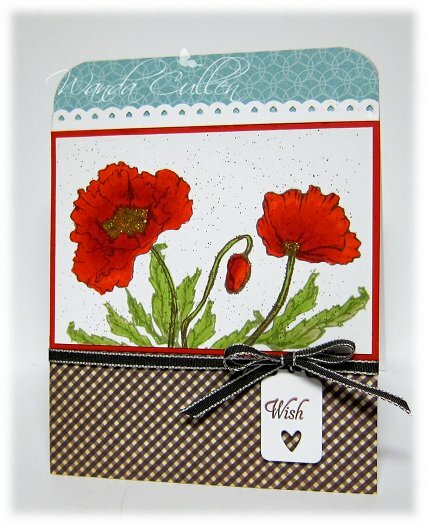 After coloring with Copics, I added yellow Stickles to the poppy centers. So...what else did I use? ACCESSORIES: Corner chomper, Small heart border punch by MS, Copics, Early Espresso ribbon, Tiny tags die by PTI, Color Spritzer tool, Yellow Stickles. What are you waiting for? Jump on over to the CTD blog and check out all the great samples by the DT and our guest designer - Amy Sheffer! 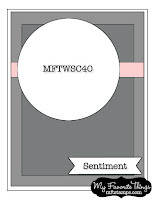 STAMPS: Love Notes (Verve) - sentiment; Sunny Days - sprig leaves. PAPER: Stella & Rose "Hazel" papers by MME, Basic Gray, Vintage Cream. INK: Old Olive, Basic Gray, Antique Linen distress ink. ACCESSORIES: Prima, Crimper, Baker's twine, Pleated satin ribbon & lace trim, Rectangle scallop die, sprig die & heart die by Verve, Distressing tool, Sponge. If you haven't been joining in the Hope You Can Cling To challenges on SCS, you'll want to check them out! There are some awesome prizes to be given away! A really quick post before heading out to work...this is a simple circle card for Beate's HYCCT challenge. The circle represents friends and family who encircle a person fighting cancer with love and support. ACCESSORIES: Tiny tag die (PTI), Lacey circle & Circle Nesties, Daisy die by SU, Button, white twine, Raspberry Fizz ribbon by PTI, Brad. Victoria's HYCCT challenge is to (H)ave (O)nly (P)aper (E)lements. 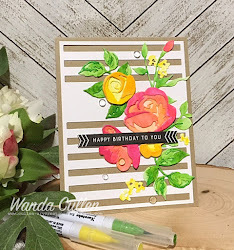 Now THIS was a true challenge, because I could hardly restrain myself from using twine or ribbon at the top of this card - lol! Papers are all from MME's 6x6 "Happier" pad on a Vintage Cream base. I used Julee Tilman's great layout for the Mojo Monday Sketch challenge. ACCESSORIES: Ornate die by Tim Holtz, Floral border EF, Little leaves Sizzlit by SU, Fern punch by MS, Mini rolled roses Die-Namics by MFT, Little tags dies by Verve. Tammy Hershberger is hostess for Monday's HYCCT challenge which focuses on friendship. 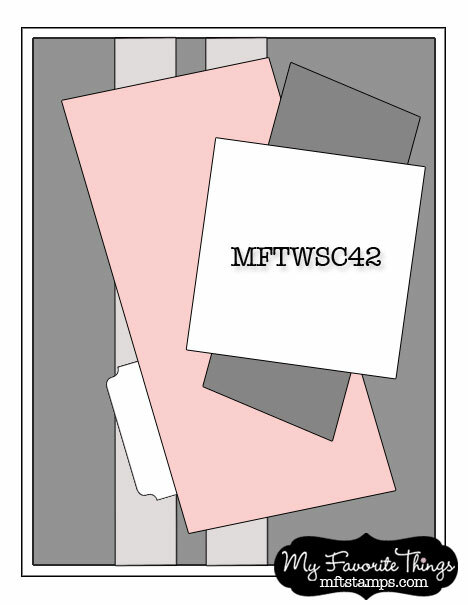 I immediately thought of an oldie but goodie set from SU called Pocket Fun. Can't you just hear the one friend reminding the other that a yearly mammogram is a must?! DP is from SU. 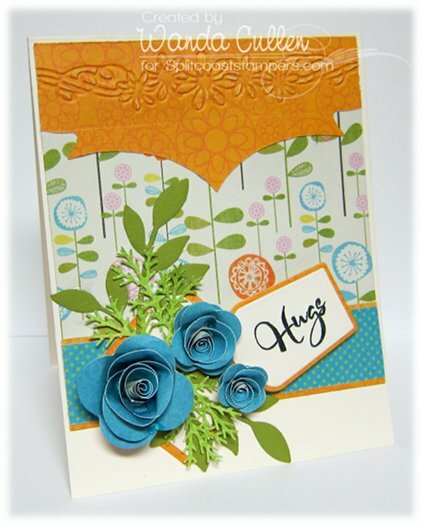 The roses were made using MFT's mini rolled roses dies. It's past my bedtime, so am saying goodnight and keeping this post short and sweet! All my fave challenges are piling up on me, so had to combine 3 in this one card to move things along faster! 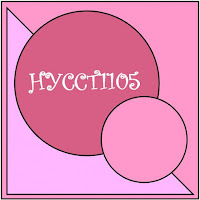 HYCCT "Things Are Looking Up" on SCS - Bridget asked us to use something we would see if we looked up in the sky and I chose to add butterflies for this one. 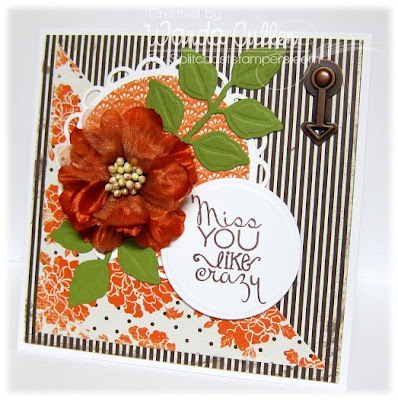 MFTWSC - another great sketch...used MFT's Flowers 3 stamp set. Be sure and check out the MFT teams' gorgeous samples in the forum! 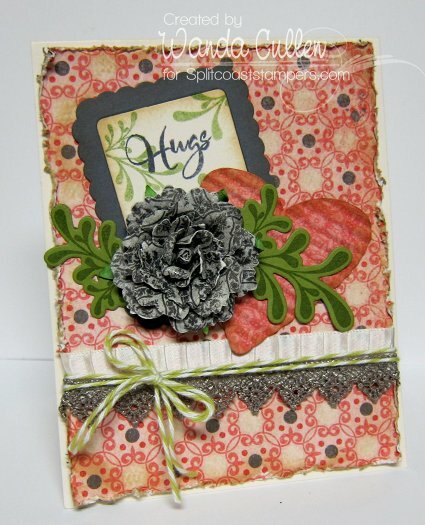 SCS Technique Lover's Challenge - Joan asked us to stack up the BG by combining at least 2 different BG stamps. I have loads of these stamps and tend not to use them much, so was thrilled to be pushed to dust them off! I stamped the floral BG in Blushing Bride and the French Script BG in black. The morning glory was colored with the following Copics: RV10, RV11, RV13, G82, YG25. I used a Martha Stewart doily tag and MFT's doily lace Die-Namic die and finished it off with some rhinestone accents. Hope you have a great Monday! The sun is out and our huge maple tree is blazing with brilliant fall colors! I'm playing "catch up" with my goal to complete all of the HYCCT challenges on SCS! This card is for Lori's challenge to use bling. ACCESSORIES: Kaiser silver pearls, Lace trim, Small flower punch from $1 bin at Mike's. Today's the day I'm hostess for the Hope You Can Cling To challenge on SCS and my theme is Hang in There! 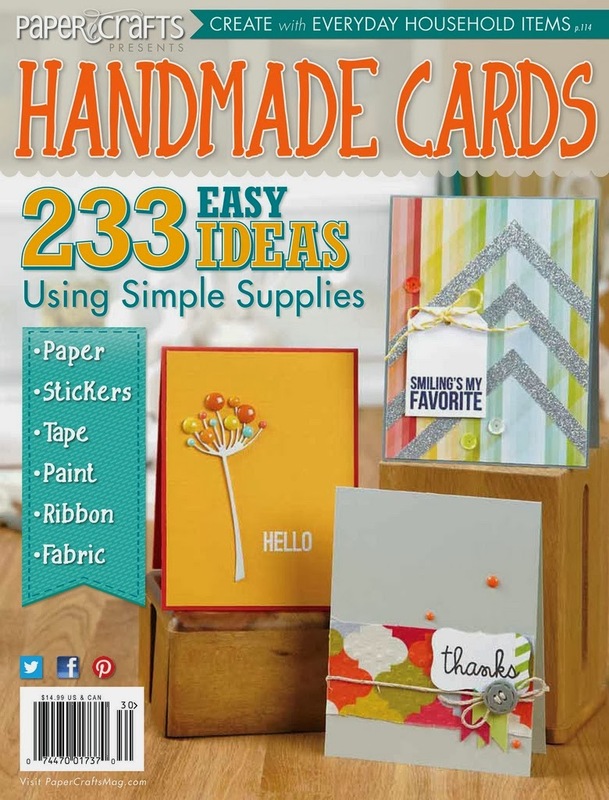 You are to use a hanging image or element on your card and in my case, I hung a Hope charm on my seam binding. My second card is for Jimmi's HYCCT sketch challenge. This one was really quick to put together since I had the die cut leaves already in my leftover pile. The papers are from MME's "Honey Cake" 6x6 pad. 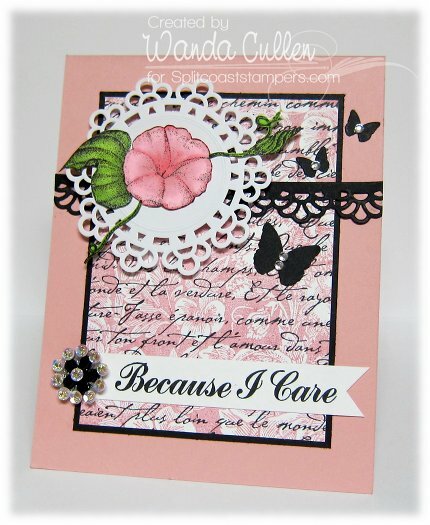 Sentiment is from Verve's Hope Blooms set. We are having the most ideal fall weather today...sun is out...it's warm and the trees are showing off their bright change of "dress"! I'm off to work this evening but will be off tomorrow again. 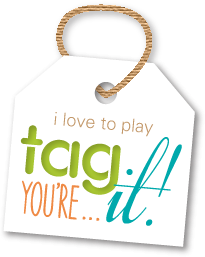 Have a great w/e!